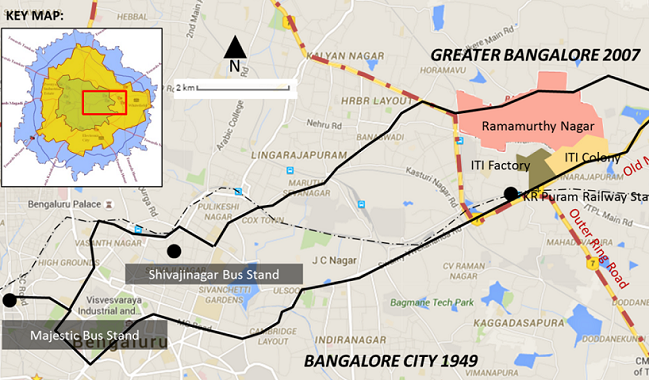 Bangalore, India’s third largest city with 8.5 million people and a decadal growth rate of 46 percent, is known for its rapid, modern development driven by electronic and software enterprises. In the last decade, quaint neighborhoods have transformed into high-rise housing and sophisticated shopping and entertainment centers with increasingly complicated road networks, overflowing with automobiles. However, there are several neighborhoods that were planned decades ago for the Public Sector Undertakings (PSU), known as PSU Townships. PSUs are corporations owned by the government of India, and they have played an important role in strengthening the economy of the country post-independence. While several PSU Townships remain restricted to outsiders, ITI Colony has, over time, become very integrated with its surroundings. It has retained many of the features from its inception in 1948, allowing residents and visitors understand what life was like 70 years ago, while showing the benefits of being an accessible and integrated area. As the rest of Bangalore is transforming into a modern city, ITI Colony still has its original low-rise, low-density charm. In 1948, the Colony was originally planned for employees of the ITI Factory (Indian Telephone Industries Limited), with limited access to entry for outsiders. The once lively factory was considered an important driver for city growth. For the last couple decades, however, the factory has not been as successful, and many of the homes and hostels have remained vacant. But the situation has benefited the city in a different way; with the ease of company regulations, non-ITI employees are allowed to wander through the Colony and, in some cases, move in. Given that rent per month ranges anywhere between 4000 to 6000 INR (US $60-90), it is considered affordable in the city of Bangalore. In addition, the ITI School, which was previously limited to children of employees, has now been opened to the general public, benefiting the nearby neighborhoods. In addition to education and housing, there are many other benefits this 500-acre township offers to both residents and visitors, one being recreation. Due to the more traditional atmosphere of the neighborhood, there is less air pollution, congestion and road traffic, providing the city with more public recreational spaces. 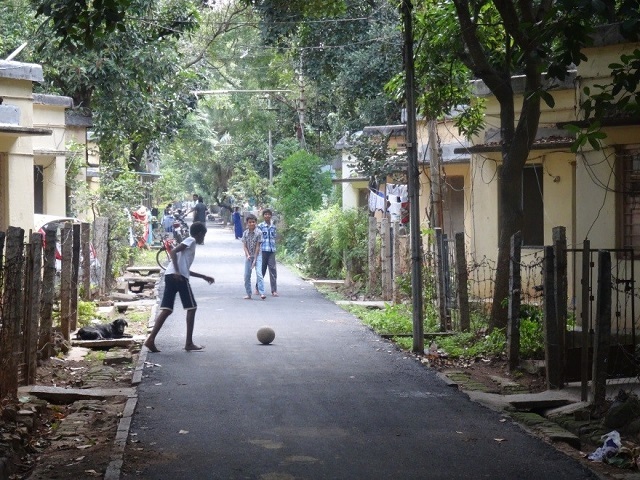 People from the adjacent neighborhoods take morning walks alongside residents from ITI Colony, and children play on the streets without the fear that many cars will pass by. The formal and informal employment opportunities in ITI used to be the “pull factor” to the Township, but, today, the open spaces and the school are important incentives for people to own or rent land nearby. A current employee of ITI, who owns a home and lives adjacent to the colony, said that the amenities of ITI Colony is an advantage even after retirement. While ITI Colony was designed to be self-sufficient, it also depends on its surroundings for various services like higher education, specialty healthcare and shopping. With non-ITI employees renting accommodation in the Colony, transportation to central, urban workplaces becomes increasingly necessary. The neighborhood now is well-connected to other parts of the city by public, as well as private, transport. ITI Colony illustrates how well-connected, porous neighborhoods that share amenities and services with one another can offer a better quality of life to its residents. The neighborhoods may benefit from each other in terms of a vibrant social life, economic opportunities, green infrastructure (parks, sports facilities etc. ), along with healthcare, education and housing. This connectivity, accessibility and sharing of amenities becomes important in modern cities where lack of space and a greater variation in demand for services does not allow for all facilities to be situated in one location or neighborhood. In this way, while the Township may represent the past, its gradual integration with the city through shared benefits and growing connectivity represent neighborhoods of the future.